What are your weekend plans, other than the Big Game? Over 200 volunteers from around the state decided to learn to be creative, identify collaboration and communication skills and try to act like kids. 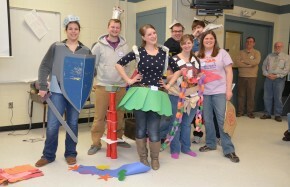 They were at NH Destination Imagination (“DI”) Appraiser Training in Londonderry. These “Appraisers” were trained to judge student team solutions at DI competitions. This year, they will appraise solutions from over 3,000 students and over 200 student teams. The next Appraiser Training is next Saturday, February 8th at Newfound Middle School in Bristol, NH. Each year, Destination Imagination or DI offers seven new standards-based Challenges in STEM, Improv, Visual Arts, Service Learning, and Early Learning. The areas of focus include: Technical, Scientific, Fine Arts, Improvisational, Structural and Service Learning. There is also a non-competitive Early Learning Challenge that allows participants to develop social and problem solving skills. Each Challenge is open-ended and enables student teams to learn and experience the creative process from imagination to innovation. Academic tournaments take place around the world where teams have the opportunity to present their solutions to trained appraisers. Students have fun and gain confidence in their ability to solve any challenge. In working to solve our Challenges, teams learn 21st century skills (creativity, critical thinking, collaboration, communication, citizenship and confidence) to build on their unique strengths.